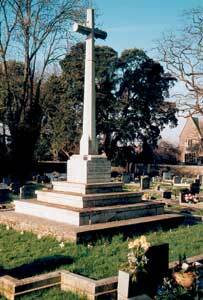 The Memorial Cross was erected to the memory of those who fell in the Great War (1914-18). The 15 foot high memorial is in the middle of the churchyard extension and is a cross of Portland stone that stands on a square plinth with three steps. It is raised on a mound edged with local pennant sandstone. Private Ethelbert W Amos (2164) served in 3rd Bn. Monmouthshire Regt. and died in battle 16th May 1915. He is buried in NEW BRITISH CEMETERY, XII.C.1. Harlebeke, West-Vlananderen, Belgium. He was born in Bristol and lived in Frampton Cotterell, Glos. Private Walter T Dowsell (12647) served in 6th Bn. Royal Berkshire Regt. and died in action 28th August 1915 age 29yr. He is buried in NORFOLK CEMETERY, I.A.4. Becordel-Becourt, Somme, France. The son of Thomas & Fanny Dowsell, Coalpit Heath, Glos. Private Wilfred Henry Chamberlain (22694) served in 12th Bn. Gloucestershire Regt. and died during Battle of the Somme 24th July 1916 age 20yr. He is commemorated on THIEPVAL MEMORIAL, Panel 5A &5B, Somme, France. The son of Albert & Elizabeth Chamberlain of Brockridge, Frampton Cotterell, Glos. Gunner Frederick Dowsell (67997) served in 70th Bty. Royal Field Artillery and died in action at Dantzig Alley, 2nd August 1915 age 22yr. He is buried in DANTZIG ALLEY BRITISH CEMETERY, Mametz, Somme, France. The son of Thomas & Fanny Dowsell, Coalpit Heath, Glos. Private William Alfred Langley (19661) served in 1st Bn. Dorsetshire Regt. and died during Battle of the Somme, 15th April 1917 age 32yr. He is commemorated THIEPVAL MEMORIAL, Panel 7 B, Somme, France. - son of Luke & Nancy Langley, and husband of Rosina, Brockridge Hill, Frampton Cotterell, Glos. Gunner Wilfred George Varlow (1854(S)) served in Howitzer Bgde, Royal Marine Artillery and died in action 25th July 1917 age 36yr. He is buried in DONZINGHEM MILITARY CEMETERY, I.A.15, Poperinge, Vlaanderen, Belgium. - son of George Varlow, Frampton Cotterell, Glos. Private Stephen Harris (240119) served in 9th Coy. Canadian Machine Gun Corps and died during 3rd Battle of Ypres, 27th October 1917 age 35yr. He is commemorated on YPRES (MENIN GATE) MEMORIAL, Panel 32, Ieper, West-Vlaanderen, Belgium. - son of George Harris, of Shermongreen Farm, Mangotsfield and lived in Coalpit Heath, Glos. Private Frederick Thomas Ralph (266752) served in 2nd/6th Bn. Gloucestershire Regt. and died during Battle of Cambrai, 2nd December 1917 age 25yr. He is commemorated on CAMBRAI MEMORIAL, Panel 6, Louverval, Nord, France. - son of Charles & Ellen Ralph, Main Road, Coalpit Heath, Glos. Private George Walters (20122) served in 14th Bn. Gloucestershire Regt. and died in action 23rd March 1918 age 25yr. He is commemorated on POZIERES MEMORIAL, Panels 40/ 41. Somme, France. - son of Mark & Harriet Walters, Mill House, Frampton Cotterell, Glos. Private William Edward Eaves (204195) served in 14th Bn. Gloucestershire Regt. and died across Somme Battlefields 26th April 1918. He is buried in HAUTMONT COMMUNAL CEMETERY, I A.14. Nord, France. - son of George & Caroline Eaves, Frampton End Rd, Frampton Cotterell. Glos. Private William James Butler (35622) served in 4th Bn. Yorkshire Regt. and was killed during Battle of the Aisne, 27th May 1918. He is commemorated on SOISSONS MEMORIAL, Aisne, France. - son of William Butler, Frampton Cotterell, Glos. Private Wilfred James Drew (50583) served in 2nd Bn. Royal Berkshire Regt. and died as P.O.W. 26th August 1918 age 19yr. He is buried in BERLIN SOUTH-WESTERN CEMETERY, XVI.C 9. Stahnsdorf, Brandenburg, Germany. - son of Samuel & Eliza Drew, Hazelmere, Coalpit Heath. Glos. Private Herbert John Green (43022) served in 8th Bn. Royal Berkshire Regt. and was killed during Battle of Cambrai, 17th September 1918 age 22yr. He is buried in UNICORN CEMETERY, VEND'HUILE, I.B 12. Aisne, France. - son of Alfred & Hannah Green, Frampton Cotterell, and husband of Agnes Julia, Watleys End, Winterbourne, Glos. Private Harold Bisp (161595) served in 62nd Bn. Machine Gun Corps and died during Battle of the Sambre on 19th October 1918 age 20yr. He is buried in ROMMERIES COMMUNAL CEMETERY EXTENSION, II.A 4. Nord, France. - son of James & Ada Bisp, Adams Land, Coalpit Heath, Glos. Private Stanley Gilbert Maggs (202728) served in 1st Bn. Wiltshire Regt. and died as part of the occupying force, 22nd November 1918 age 23yr. He is buried in COLOGNE SOUTHERN CEMETERY, XII F 12. Nordheim, Westfal, Germany. - son of Oliver & Jane Maggs, Rose Cottage, Kendleshire, Glos. Driver Percy C Biggs (T/16530) served in Royal Army Service Corps and died on 21st May 1940 age 39yr. He is buried in St. ANDRE COMMUNAL CEMETERY, AA. 10. Nord, France. - son of Charles & Ellen Biggs and husband of Lena Kathleen, Watleys End, Winterbourne, Glos. Gunner Norman Hawthorne King (1521592) served in 66th Searchlight - Royal Artillery (4th Bn. Gloucestershire Regt.) and died 3rd November 1940. He is buried at COALPIT HEATH, St Saviour's Churchyard. - son of Martha King, Pucklechurch, Glos. Edith Doyle died 27th February 1941 age 37yr. when lone aircraft bombed the Parnall Aircraft Factory, Yate. She was wife of W J Doyle, Park Lane, Kendleshire, Glos. Douglas D Luton died 27th February 1941 age 22yr. by midday single bomb at the Parnall Aircraft Factory, Yate. He is buried at COALPIT HEATH, St Saviour's Churchyard. - son of Thomas & Rosina Luton, Coalpit Heath, Glos. Phyllis M Tovey died 27th February 1941 age 21yr. when a single bomber hit the Parnall Aircraft Factory, Yate. She was daughter of Albert Tovey, Henfield, Coalpit Heath, Glos. Sailor Benjamin A Staddon serving on S.S.Toronto City, Merchant Navy and died at sea on 2nd July 1941 age 18yr. He is commemorated on TOWER HILL MEMORIAL, Panel 109. Trinity Square, London. - son of John & M Staddon, Frampton Cotterell, Glos. Sergeant Eric Thomas Cook (572721) served in 10th Sqdn. Royal Air Force and died in action 16th July 1943 age 21yr. He is commemorated on RUNNYMEDE MEMORIAL, Panel 146, Surrey. - son of Mr & Mrs Edward Cook of Frampton Cotterell and husband of Elizabeth, Tonyrefail. Glam. Guardsman Harold Frederick Williams (2665106) served with 3rd Bn. Coldstream Guards and died during invasion of Italian mainland, 25th September 1943 age 22yr. He is buried at SALERNO WAR CEMETERY, V.D.39. Italy. - son of Frederick & Myra Williams, Coalpit Heath, Glos. Wireman Philip E Penton (D/JX 569538) served on H.M.S. Mahratta, Royal Navy and died at sea 25th February 1944 age 18yr. He is commemorated on PLYMOUTH MEMORIAL, Panel 91, Plymouth Hoe, - son of William & Martha Penton, Henfield, Glos [Parents burried at St Saviour's, Grave Ref 143]. Private Peter Corcoran (14274181) served in General Service Corps and died 10th March 1944 age 41yr. He is buried at COALPIT HEATH, St Saviour's Churchyard. - son of Peter & Caroline Corcoran, Woodend Road, and husband of Mary, Frampton Cotterell, Glos. Private Albert William Cryer (14645696) served in 2nd Bn. Gloucestershire Regt. and died during landings on Normandy, 11th June 1944 age 19yr. He is buried in BAYEUX WAR CEMETERY, XV.C.15. Calvados, France. - son of Henry & Ruth Cryer, Yate, Glos. Telegraphist Harold Reginald Green (LT/JX405478) served on H.M.Trawler - Birdlip, Royal Naval Patrol Service, died at sea, 13th June 1944 age 20yr. He is commemorated on LOWESTOFT NAVAL MEMORIAL, Panel 15 Column 1, Suffolk. - son of Alfred & Alice Green, Frampton Cotterell, Glos. Driver Arthur William Redmore (14532629) served in Royal Corps of Signals and died during landings in the Netherlands, 2nd October 1944 age 21yr. He is buried at JONKERBOS WAR CEMETERY, 19.A.1. Nijmegen, Netherlands. - son of William & Ethel Redmore, Frampton Cotterell and husband of Muriel, Downend, Glos. Private Frederick John May (14660866) served in 10th Bn. Gloucestershire Regt. and died 23rd November 1944 age 20yr. He is buried in TAUKKYAN WAR CEMETERY- 7.H. 7. Myanmar, Nr Rangoon, Burma. - son of Stanley & Ester May, Nibley, Coalpit Heath, Glos. Flight Lieutenant Roy Hubert Hussey DFC, DFM, (145116) served with 19th Sqdn. Royal Air force Volunteer Reserve and died 20th February 1945. He is buried at Christ Church Churchyard, COXLEY, Somerset.